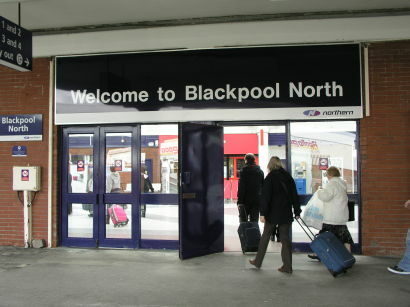 VISITOR numbers at Blackpool were sharply down this year, and the fall is being attributed to the extensive disruption which affected train services in north west England over the summer. Northern was hit by problems when timetables changed on 20 May which it says were mainly due to late-running electrification work, while a long series of strikes has also been causing many cancellations and delays. The industrial dispute with the RMT over on-train staffing is continuing, and the union has announced further walkouts on every Saturday to the end of the year. New survey figures show that the number of day trips to Blackpool was down by almost 400,000 this summer compared with 2017. Longer-stay visits remained steady at about 1.5 million, but the total of day visitors fell from 1.7 million to 1.3 million. The number of people arriving by train at Blackpool this year has been more than 15 per cent lower so far than in 2017. The deputy leader of Blackpool Council Gillian Campbell said: ‘After the long-awaited completion of electrification works and the introduction of new direct services to Blackpool, this summer should have seen an upsurge in inbound rail travel. Instead our passenger numbers have gone backwards. ‘Although the fall in day trips is a small percentage of our visitor market and our overall visitor numbers are still higher than 2016, it is disappointing given the level of investment in new attractions this year. Blackpool and its tourism industry bore the brunt of the cancellations and delays after the new Northern timetables came into effect in May and it is hard not to conclude that that has had a significant negative impact. Ms Campbell added that she was nonetheless grateful for extra support from Northern. The operator sponsored the annual two-day air show this year, and also helped to pay for marketing and an additional fireworks display.